This is the second Jana Petken novel I’ve read and I was not disappointed. Her debut work, Guardian of the Secrets, is an outstanding read and she has followed it up with yet another, in Dark Shadows (The Mercy Carver Series, Book I). The novel begins on the day Mercy is born in a poor section of 1800’s London. She grows to be a striking young lady but is doomed to an arranged marriage to an older and extremely unattractive man. Seeking just one day of freedom before she weds, she ventures out of her impoverished neighborhood into greater London only be become the unwilling victim of sadistic scoundrels. What happens next, I’ll let you discover on your own when you read the book and, I can assure you, you will not be able to put it down! Ms. Petken draws the reader in from page one and does not let go. Her meticulous attention to detail and marvelously descriptive writing, transports the reader back to a distant time and place. 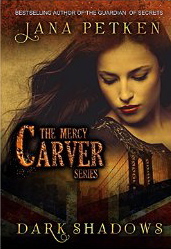 Her characters are deftly drawn and it is impossible not to find oneself thoroughly invested in discovering Mercy Carver’s fate. Dark Shadows, the first book in the Mercy Carver series, is a compelling read and one I will not soon forget. I can recommend it most highly for any who enjoy historical fiction, romance, and a real page-turner! FROM WIKI.EZVID: 9 TERRIFYING HORROR BOOKS THAT WILL QUICKEN YOUR PULSE! Linda Watkins on VOODOO SUMMER by Aaron Paul Lazar ~ On Sale Now! Aaron Paul Lazar on VOODOO SUMMER by Aaron Paul Lazar ~ On Sale Now! Diane Wilson-Thomas on Linda’s Dog Tales: MEET THEO!